Everybody wants top quality healthcare. In celebration of World Quality Month, we took a closer look at data from the top independent healthcare research associations to see where some of the best hospitals in the country are. We wanted to see who was saving the most lives, causing the least complications, and scoring highest on patient satisfaction reports. What we found was that a large number of our clients, past and present, are gracing many of these top lists. The root cause of the success of these organizations comes down to leadership embracing the concepts of continuous improvement, and performance excellence, and constantly striving to improve. 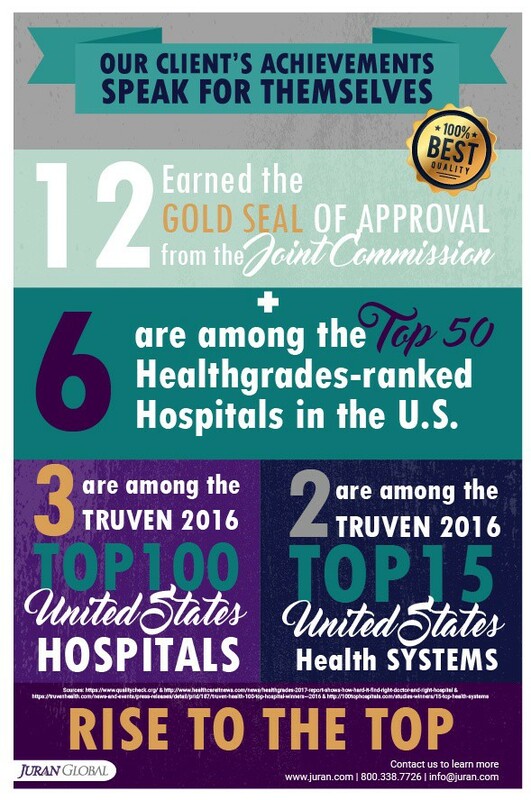 The Truven Health 15 and 100 Top Hospitals studies are the only studies of their kind that aggregate such extensive individual hospital performance metrics. Readmitted patients less frequently and experienced fewer deaths within 30 days of admission — should these be split up? Based solely on clinical quality outcomes, Healthgrades 50 best hospitals for 2016 are in the top 1 percent of hospitals in the nation for providing overall clinical excellence across a broad spectrum of conditions and procedures consistently for at least six consecutive years. Among many other benefits, certification by the Joint Commission Gold Seal of Approval Provides a framework for organizational structure and management. Accreditation involves preparing for a survey and maintaining a high level of quality and compliance with the latest standards. Joint Commission accreditation provides guidance to an organization’s quality improvement efforts. So if you’re a healthcare executive aspiring to top the Truven 15 — where do you begin? The mountain may seem tall, but it is not insurmountable. One of the first steps you can take is to analyze your organization’s effectiveness and efficiency using our complimentary Organization Health Check assessment. Then give us a call; we’ll guide your way.